Which BLS Model Should I Use? Connecting and using the BLS is very easy, just connect it and forget it! The device works off of the power of the battery, and therefore does not have to be plugged into AC power. All of the units come with two leads(wires) just like jumper cables. Some units are equipped with alligator type clips and others come with eye rings for permanent attachment to the batteries. 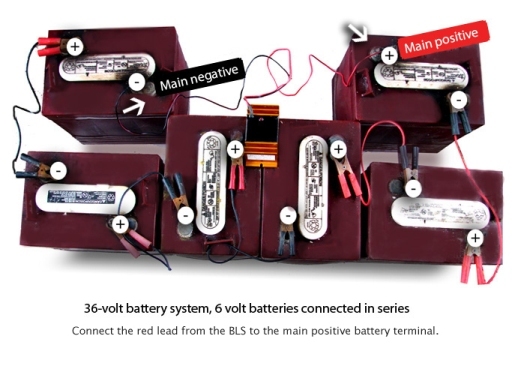 The following pictures show you how to connect the Battery Life Saver electronic device to a battery system. The example system is the same battery arrangement of a 36 volt Club Car DS, it is six 6 volt batteries connected in series. 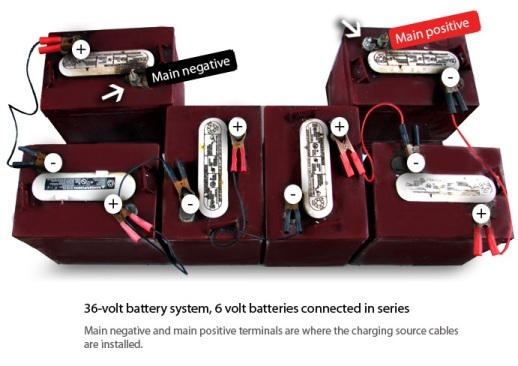 The main positive and main negative terminals are the same battery terminals that the charger or charging source cables are connected. First connect the black wire from the Battery Life Saver electronic device to the Main negative battery terminal. The BLS is now connected and the LED be on. Finally, securely fasten (with self tapping screws or Ty Wraps) the BLS to something metallic (for example the metal frame of a golf cart).